Bugs. The word alone conjures up images of buzzing swarms and annoying, creepy-crawly pests. They're unavoidable on a camping trip, and you can bet they'll be at your next campsite whether you're ready for them or not. Here are some tips to help you keep bugs away while still enjoying the wonders of the wilderness. If the bugs—particularly mosquitoes, black flies, ticks and ants—are bad at a campsite, oftentimes the only refuge is your tent. It's important to keep the tent doors and screens zippered shut. If you don't, that refuge might be filled with insects and creepy crawlies. This is not limited to the daytime; remember to close the door behind you if you have to leave the tent at night, even for a second. Remember to shake a bit before entering the tent, to remove any bugs that might already be clinging to (or sucking at) your skin. You can't keep bugs away if your repellent doesn't work. Check to make sure your bug repellent is waterproof. 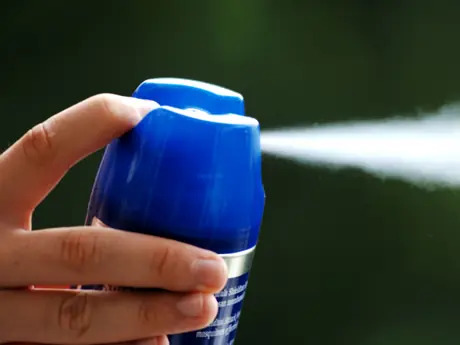 Like sunscreen, your repellent it will be worthless if it can't stand up to sweating or splashing around in a lake or river. There is a lot of scientific opinions about what attracts bugs to certain people. Diet, body type, gender and blood type have all been thrown into the discussion about possible factors. Most agree, however, that bugs are particularly attracted to overly fragrant hygiene products like perfume, soap, shampoo, aftershave and deodorant. Though you don't need to go full-blown au naturel, buy hygiene products that are free of artificial or botanical fragrances or, better yet, completely unscented. Mosquito eggs are laid in moist settings, and they hatch into larvae that mature in water. In other words, mosquitoes need water in order to start their lives, so you can expect an influx of bugs following rainstorms. Post-rain is when eggs will hatch, and that's when the woods will be the buggiest. As you might imagine, you're in for an even buggier experience if your campsite is near a place that is always wet, like a swamp or a bog. To combat this, always choose a campsite that is high and dry. John Andrew Pendery is a writer and editor living in New York City.